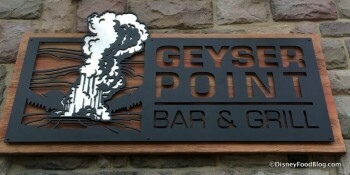 As part of the ongoing expansion of Disney’s Wilderness Lodge, Geyser Point Bar & Grill joined the scene in February 2017. Located near the Resort’s main pool, this unique space is a hybrid of a bar and Counter Service options. The Featured Cocktail list boasts beverages unique to Geyser Point, and each features spirits from Northwest distilleries in keeping with the theme of the Resort. Hearty appetizers can be ordered from the bar as well, and Counter Service options provide full entrees. The open air restaurant offers gorgeous waterfront views, and a fireplace for the evenings. The unique Counter Service/Bar and Table Service set-up offers something to please almost any taste. Get Your Cinnamon Glazed Almonds Fix at Disney’s Wilderness Lodge This Holiday Season!